Denver has been absolutely on fire with musical talent, and weeknights in the city are no different than the weekends. 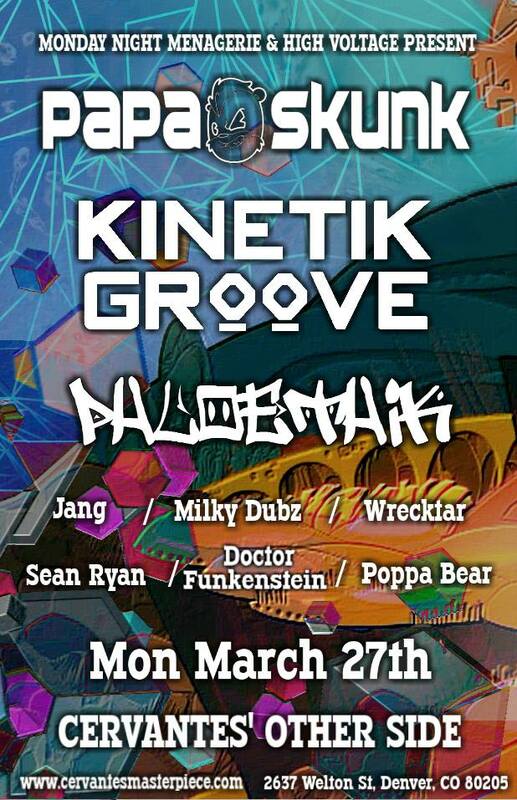 Old school Denver producer Papa Skunk will be taking over the Other Side of Cervantes’ Masterpiece Ballroom with local artists Kinetik Groove, PHloEthik, Milky Dubz and many, many more. The Monday Night Menagerie has been popping off every week and this one is more stacked than usual to ensure an entire night of bangers. Stay ahead of the music curve and peep these artists before they blow up – Monday Night Menagerie will not disappoint and provides plenty of booty grooving bass to keep you coming back for more. Stream the latest from Kinetik Groove below to get hyped for tonight’s shenanigans – we’ll see you on the dance floor. Tickets are still available online and the box office.